Eggplants look just like eels! Juicy and tender eggplants go great with white rice!!! 1. Make a few holes in the eggplants so that they won't explode. Make an incision around the stem end. 2. Place them directly on a stove on a baking rack if you have (or in a frying pan, grill, oven, or toaster oven), then roast until the skins get wrinkly and tender inside. You can also wrap in plastic wrap and microwave at 600w for 2 minutes. 3. Cool until you can handle them, then remove the skins. Make an incision lengthwise and open. 4. Heat the eel sauce in a frying pan until it begins to bubble. Place the eggplants and cook until the liquid is gone. 5. 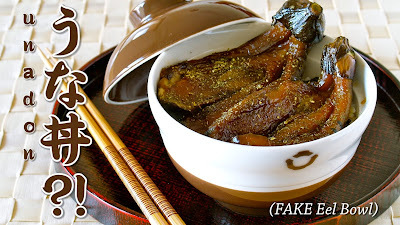 Serve cooked rice in a rice bowl, layer some Kizaminori (finely shredded Nori seaweed sheet), place the eggplants, then sprinkle with Sansho Japanese pepper if you like.